HEIGHT AND PRICES – Prices of daily admission are based on height. Rates are different for over 48 inches and under 48 inches. Children 3 years old and younger under are FREE. Check actual rates on our Daily Tickets page. HEIGHT AND SAFETY LIMITS – The big 4 story slides are 42 inches minimum, the big slide on the Mezzanine is 40 inches and the other slides on the mezzanine are 36 inches. Slide heights are set by the manufacturer of the slides for safety reasons and are adopted by Oklahoma Dept. of Labor as their rules. As a result, we are unable to grant exceptions. WEIGHT AND SAFETY LIMITS – The manufacturer’s safety limit for our slides specifies: Maximum combined weight on a 2-person tube is 375 pounds. Maximum weight on a single tube is 275 pounds. AGE LIMITS – We have no age limits from little tykes in the 6 inches of water in the infant pool. LITTLE ONES NOT YET POTTY TRAINED? – No problem! We require swim diapers. You can bring your own or you can buy them in our store at our cost. FLOTATION DEVICES – You may use U S Coast Guard approved flotation devices (water wings are not approved). We also have FREE life jackets available for use. TOWELS – It’s best to bring your own towels. But we do have some towels for rent at nominal fee. Please do not bring your room towels from the hotel. SUNSCREEN – Usually sunscreen is not needed except if you stay in the sun when the roof is open. Sunscreen is available for purchase in our store. BATHING SUITS are required. Thongs are not permitted. No buckles or zippers on suits. We have showers and changing rooms. We sell bathing suits in our store. Tops or T-shirts can be worn over your bathing suit, if you desire. LOCKERS – Are available for rent. Ask to add a locker to your wrist band when you first arrive. Lockers are about 18 by 24 inches and 12 inches deep. OUTSIDE FOOD – May NOT be brought into the Water-Zoo. FOOD SERVICE – Our food is first quality – like 1/4 pound all beef hot dogs – and our prices are competitive with other places with quality food. GOOD SIZE PORTIONS – QUALITY FOOD – SAFE FOOD. GLUTEN FREE – We have Gluten Free items on our menu. Ask the concession cashier for more information. SLIDES AND TUBES – 2 of the big 4 story slides are tube slides. They are 36 inches wide and we provide a 1 or 2 man tube at no-charge. The ride is not designed to handle larger tubes. The purple 4 story slide is a BODY slide. No tube is allowed or needed. All of the slides on the Mezzanine are BODY SLIDES. LAZY RIVER – You can walk in the Lazy River (either direction), you can swim in the Lazy River, or you can ride a 1 or 2 man tube in the Lazy River. There is no charge for our tubes. WAVE POOL – Same as Lazy River. WATER DEPTH – The deepest water is 4 1/2 feet and in some areas the water is only 6 inches deep. There are attendants on shallow rides and lifeguards on water 4 1/2 feet deep. We have free life jackets if you don’t swim well. TEMPERATURES – The water temperature is 83°F or above and the air temperature 86°F or above year round. We have large fans that are about 24-feet in diameter and the roof panels open, so if it gets too warm we have ways to make it comfortable. THUNDER OR LIGHTNING – We do not close the pools for thunder or lightning, except when we have a big cell right at our location or very close. GROUP RATES – Are available for groups of 10 or more. Contact our marketing department by email or phone. Our staff regularly handles birthday parties, school trips, company parties, church fundraisers, and we can handle your group, no matter the size. We have 3 meeting rooms which can be opened into one large meeting room. CREDIT CARDS – We accept credit and debit cards. Visa, MasterCard and Discover. SPLASH CASH – Once inside the park we are a cashless facility. You can add splash cash to your wrist band at the main entrance or use your credit card. OBSERVERS – We do not have an observer rate. Guests are welcome to stay in the food court area and watch TV or watch the swimmers through our large glass wall for FREE, but some parts of the aquatics area are not visible from the food court wall. Better to buy a ticket. GIFT CERTIFICATES – We have them available online or at the park in almost any denomination. If purchasing them online we’ll send you a confirmation and send the recipient their gift certificate from you electronically. 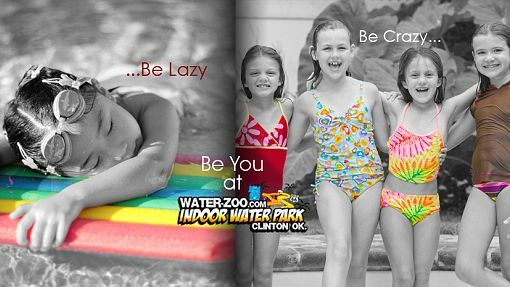 ADA AND SPECIAL NEEDS CHILDREN – The Water Park is ADA compliant and also special needs friendly. The 4 story slides and the Mezzanine do require walking to them. If guests are unable to walk to those two areas then those guests may also not be able to handle those rides. For example, the body slide requires you to be able to move your hands and arms in and assume a pulled in elbows position. All the rest of the park including showers and restrooms are ADA and special needs friendly and compliant. The activity pool does have an ADA lift as well.